The terms "ethnic" and "traditional" are used when it is required to emphasize the cultural roots of the dance. In this sense, nearly all folk dances are ethnic ones. If some dances, such as polka, cross ethnic boundaries and even cross the boundary between "folk" and "ballroom dance", ethnic differences are often considerable enough to mention, e.g., Czech polka vs. German polka. Dances not generally designed for public performance or the stage, though they may later be arranged and set for stage performances. New dancers often learn informally by observing others and/or receiving help from others. 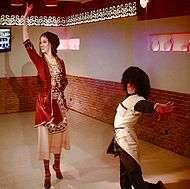 More controversially, some people define folk dancing as dancing for which there is no governing body or dancing for which there are no competitive or professional institutions. The term "folk dance" is sometimes applied to dances of historical importance in European culture and history; typically originating before the 20th century. 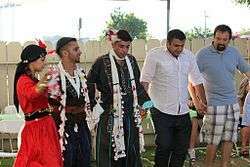 For other cultures the terms "ethnic dance" or "traditional dance" are sometimes used, although the latter terms may encompass ceremonial dances. 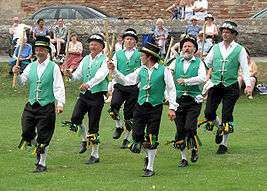 There are a number of modern dances, such as hip hop dance, that evolve spontaneously, but the term "folk dance" is generally not applied to them, and the terms "street dance" or "vernacular dance" are used instead. The term "folk dance" is reserved for dances which are to a significant degree bound by tradition and originated in the times when the distinction existed between the dances of "common folk" and the dances of the "high society". A number of modern ballroom dances originated from folk ones. Sword dances include Longsword dances and rapper dancing. Some choreographed dances such as contra dance, Scottish country dance, and modern Western square dance, are called folk dances, though this is not true in the strictest sense. Country dance overlaps with contemporary folk dance and ballroom dance. Most country dances and ballroom dances originated from folk dances, with gradual refinement over the years. People familiar with folk dancing can often determine what country a dance is from even if they have not seen that particular dance before. Some countries' dances have features that are unique to that country, although neighboring countries sometimes have similar features. For example, the German and Austrian schuhplattling dance consists of slapping the body and shoes in a fixed pattern, a feature that few other countries' dances have. Folk dances sometimes evolved long before current political boundaries, so that certain dances are shared by several countries. For example, some Serbian, Bulgarian, and Croatian dances share the same or similar dances, and sometimes even use the same name and music for those dances. International folk dance groups exist in cities and college campuses in many countries, in which dancers learn folk dances from many cultures for recreation. Balfolk events are social dance events with live music in Western and Central Europe, originating in the folk revival of the 1970s and becoming more popular since about 2000, where popular European partner dances from the end of the 19th century such as the schottische, polka, mazurka and waltz are danced, with additionally other European folk dances, mainly from France, but also from Sweden, Spain and other countries. Bhangra a Punjabi harvest dance and music style that has become popular worldwide. Wikimedia Commons has media related to Folk dance.